As I write this report I’m struck by the number of items we have to report to the membership over the past several months. To say that this summer has been a whirlwind of activity for Local 293 would be an understatement. At the top of the list would be the Canadian Conference held at the Sheraton Hotel from August 9-13. The first two days were devoted to officer training workshops that all but two members of the board took part in. In fact I would like to acknowledge the fantastic job the entire board did in helping to put on this Conference. Special thanks go to Canadian Conference Committee Chair Janna Malseed, co-chair Brent Malseed and committee members Glen Brown and Ryan McKenna. As co-chair I could not help but be impressed with everyone’s efforts and commitment to doing the very finest job possible. We employed over 40 AFM members and by all accounts the delegates expressed their unanimous opinion that this was the best Conference they had attended. The Sheraton Hotel bent over backwards to accommodate us and went above and beyond the call. I was glad to see some of our members took the time to attend the proceedings and get a firsthand glimpse of the AFM at work. Brent and I recently wrapped up negotiations with the HPO after two sessions. Special thanks to the HPO negotiating team headed by Steve Mosher and the HPO management. It’s gratifying to see management and players on the same page working harmoniously. It was a pleasure working with HPO Executive Director Diana Weir and HPO board member/lawyer Lindsay Doyle towards a common goal. The ratification vote takes place November 10th and we expect it to be viewed favourably by the orchestra members. We are awaiting board approval from the Workers Arts and Heritage Centre on a written agreement with Local 293 concerning the exclusive use of AFM members for any WAHC musical events. Up until now we have had an unwritten agreement that stipulated the use of AFM members and mandatory temporary membership permits for non-members. This agreement will formalize our existing relationship guaranteeing more work for our members. Once again Local 293 has participated in the annual Labour Day Parade with all our friends in the labour movement. Entertainment was hired by the Hamilton and District Labour Council with an assist from the MPTF. Local 293 members Annette Haas, Ginger Graham and Steve Fuller were the acts employed. Also in attendance were our political friends Tom Jackson, Monique Taylor, Scott Duval and Andrea Horwath all in support of organized labour. On September 19, Brent and Janna Malseed and I attended a meeting at the CFM office in Toronto to discuss various issues with the International Executive Board of the AFM. Among the topics discussed were educational initiatives, consolidation of Locals and financial issues. The meeting was very productive and we should have some promising news shortly. Lastly, with the unprecedented growth of the membership of over 335 more members over four years we are spending more time servicing the membership and our per capita payments to the AFM are over $9,000 per quarter. Coupled with rising costs-rent, utilities and our outstanding debt payments to the AFM we find it necessary after much deliberation to ask for a dues increase of $10 for regular members and $5.50 for Life members. The early bird special will still apply and paying before January 1st will still be at the old rate. This issue was discussed with VPC Alan Willaert and he suggested the increase due to the razor thin margins this Local is working with. The last time dues were raised was in 2012 when the AFM asked for a per capita increase of $10 which went directly to the AFM. Neither I nor anyone I consulted with could remember the last time the Local asked for a raise in dues. While we are looking at ways to cut costs it remains vital to the Local’s stability to get a little more breathing room with our finances. We have been extremely busy at the guild office much of this year with all the planning and organization involved in hosting the 2017 AFM Canadian Conference of Musicians at the Sheraton Hamilton Hotel in August. The last time Hamilton hosted a Canadian Conference was in 1985. This years conference was a huge success and our local has received many positive accolades verbally and in writing from many of the officers, delegates and guests who attended. The success of this conference would not have been possible without the hard work and support from all Local 293 Executive Board members and member volunteers that worked so well together. I would like to make a special shout out to Janna Malseed who took on the responsibility to Chair the Conference Host Committee. The other committee members were Glen Brown and Ryan McKenna, Larry Feudo & Brent Malseed. A banner that was displayed across Main Street West in front of Hamilton City Hall during the conference was greatly appreciated by all officers, delegates and guests to the city. In fact, AFM President Ray Hair and AFM Secretary-Treasurer Jay Blumenthal were so impressed with the welcome that they circled around the block to get a photo of the welcome banner before checking into the hotel. Note: A City of Hamilton Vehicle Flow Study shows the traffic at Main Street West under the banner averages over 50,000 vehicles per day. During the week of our conference, the drivers and occupants of over 350,000 vehicles would have seen our welcome banner and this does not account for number of pedestrians that travel this busy downtown location at City Hall. When AFM President Ray Hair and many others arrived at the hotel, they were greeted by the ambiance of a String Quartet of HPO musicians performing in the lobby of the Sheraton. The promotion of live music to all delegates, guests and the general public was one of the main goals of the Host Committee. To accomplish this goal, we needed funding and the committee worked diligently to obtain sponsorships and cofunding from various sources. We published a souvenir program booklet for the conference and raised funds through advertising space to local businesses, labour organizations, politicians and many other sources. We were amazed at the support we received from the community and were able to raise over $14,000 to cover promotion and employment of professional musicians who performed live music to the general public and guests of the Sheraton Hamilton Hotel. The Hamilton Musicians Guild engaged over 40 local musicians to perform during the week of the AFM Officers Training and the Canadian Conference of Musicians at various locations in the hotel including the Hotel Lobby, The LOFT Restaurant & Pub and Meeting Rooms. We are so grateful to all the support we received from the FirstOntario Credit Union, the Musicians Rights Organization of Canada (MROC), the Hamilton & District Labour Council, the City of Hamilton, the Sheraton Hamilton Hotel, Core Entertainment , Local, Provincial and Federal Politicians and many other individuals and organizations who support live music in the community. I would like to encourage members to register with Music Finder. This has worked well for members who are looking for referrals from the public. 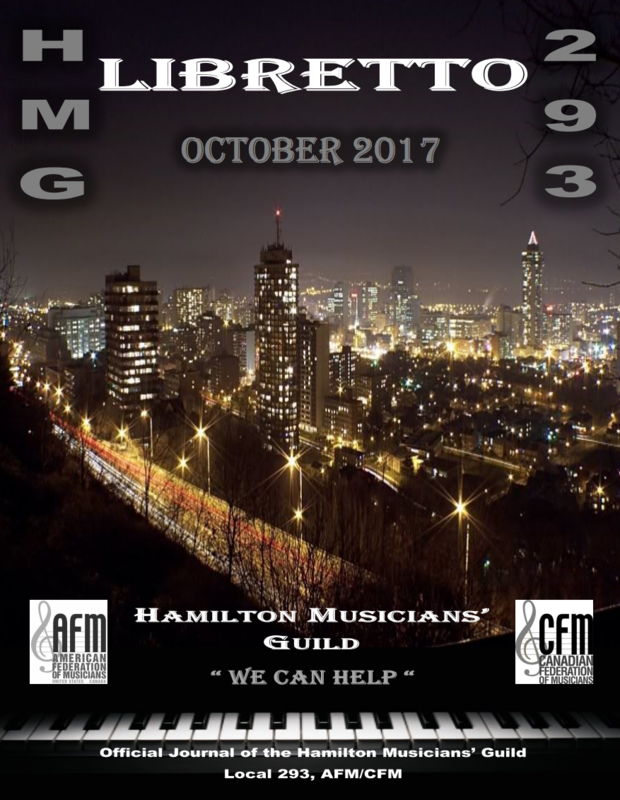 This will not only help you to promote yourself and your abilities, but it will also promote the Hamilton Musicians’ Guild to the public. The Local 293 office has started to use this tool to direct inquiries for hiring musicians or teachers. Time to register your information – go to the Private Members Area to ‘Submit Your Profile’. We are located at http://www.hamiltonmusicians.org/ As always, your participation in this program is important and appreciated. This fall, there will be elections for all positions to your Local 293 (Hamilton Musicians’ Guild) Executive Board with the exception of the Secretary-Treasurer’s position. This is an important part of building a strong and democratic local and it happens every two years. If you feel you have something to offer the local and would like to serve your fellow members, join us at the Nominations Meeting on October 16, 2017. If you have questions about the time commitment and responsibilities, contact the office for details. In closing I would like to express my gratitude for such a positive and productive Executive Board that works well together and contributes of their time and energy to ensure that musicians can live and work in dignity and be compensated fairly. With the current board and support of the members, we can oppose the forces of exploitation through our solidarity. It is with heavy hearts that we inform you of the death of a long time employee of the Hamilton Musicians Guild, Jacquie Patton, on August 21, 2017. As many of our members will remember, Jacquie worked for the Local as an Administrative Assistant for many years. She was also a well-respected piano teacher in Dundas, Ontario. She thoroughly enjoyed meeting many of our members who came into the office to process their annual dues or file contracts or seek advice. Jacquie very much enjoyed providing advice to the members on their musical careers. She was giving and thoughtful, and many of our members enjoyed chatting with her. Jacquie very quickly went from a co-worker to a close personal friend and part of my family and we shared many conversations on raising children, the latest fashion, cooking and decorating. After a brief and courageous time with cancer, she passed away peacefully with her family by her side. She is survived by her husband and best friend of 60 years, Keith and her loving daughter Lesley Calvert and husband Charlie. Jacquie thoroughly enjoyed her role as Grandma to her treasured grandchildren Ben and Erin. There was a Celebration of Life on September 9th in Dundas which Brent and I attended. We extend our condolences to Keith, Lesley, Charlie, Ben and Erin. Jacquie will be missed. Donations can be made to the Hamilton SPCA in memory of this very special lady. I don’t know if it’s the fact that I’m getting older or what, but it seems that the summer flew by in the wink of an eye. Glad to see so many of our Local 293 members out there entertaining at festivals, ribfests, fairs and outdoor concerts. Although the weather wasn’t always co-operative you could always depend on Local 293 members to provide a consistently professional product. It was great to see our friend and 293 member Sue Leonard reunited with her old boss k.d. lang recently. They hooked up back stage when k.d.’s Ingenue Anniversary tour hit Hamilton. Sue was a part of the original Ingenue recording sessions and subsequent tours when she was based in Western Canada. She’s back living in Hamilton now and can be seen locally with several acts. The band Cootes Paradise which features Sue’s extraordinary vocal work is poised to release their first album. Look for it in the weeks to come. Here’s a date to mark down on your calendar – Saturday November 4. Local 293 will be staging a concert to raise funds for the Bob Pedler Memorial Fund. The fund was established by Local 293 many years ago to honour the memory of Bob Pedler, a former 293 executive and popular Hamilton musician and music store owner. The purpose of the fund is to help any of our members who are experiencing physical setbacks which prevent them from practising their craft. It is meant to augment disbursements of the Lester Petrillo Fund, an AFM charitable trust fund which provides similar assistance. The afternoon concert, to be held at the Corktown Tavern from 1:00 pm to 6:00 pm, will see many Local 293 members lending their time to this worthwhile endeavour. There will be a $10 cover charge with100% of the proceeds going to the Bob Pedler Memorial Fund. If you would like to get involved feel free to call Brent at the Local office (905-525-4040). In addition to raising money for the Pedler Fund the concert will also pay tribute to a few local music lovers who have had an impact on the Hamilton music scene. They will be honoured as recipients of the George R. Robinson Award. You may recognize that name, as it graces Gage Park’s iconic bandshell. Mr Robinson was the first president of the Hamilton Musicians’ Guild and leader of the Royal Hamilton Light Infantry Band. We plan on invoking his name once again to bring attention to a select handful of individuals who have generously contributed their time and talent to promoting Hamilton’s diverse musical community, particularly through their generous support of live music. Kevin Barber has uploaded literally hundreds of episodes of his “Barber Shop” podcasts. Each one is focused on a Hamilton artist or group and includes insightful interview and live performance segments. Luis Pereira and Linda Fraser are founders and administrators of the popular Blues Hamilton website. They do their utmost to spread the word on Hamilton music by posting a comprehensive listing of music news and gig and concert listings. They are well known fixtures at local clubs and concerts along with mascot, Treble Clef, the monkey. Finally, Graham Rockingham is well known throughout the city for his work as music editor of the Hamilton Spectator. His concert coverage, album reviews and artist profiles are always intelligent, informative and entertaining. We hope you will join us on November 4 in honouring these worthy recipients. Finally while we are on the subject of honours it was great to see past Local 293 president Matt Kennedy recognized with a Lifetime Achievement Award at the recent CFM Canadian Conference hosted in Hamilton by our local and the American Federation of Musicians.. Matt was presented with his award at the Gala Dinner which also featured exciting performances by Harrison Kennedy and Jesse O’Brien, Darcy Hepner’s All Star Jazz Combo, former Local 293 Secretary-Treasurer Carmen Nemeth and her string ensemble, Panache, as well as Juno winner Jack de Keyzer. The evening proved to be a great opportunity for Hamilton to showcase some of its musical treasures. The Local 293 Office sends out important advisories to members by email and we want to make sure that you’re not left in the dark! It is important to notify the office of any changes to your contact information. This includes your email address, phone numbers and home address. Call 905-525-4040 or email ( local293hmg@bellnet.ca ) to make sure that we have your correct contact information. You can also update your contact information online by going to: http://www.afm.org / on the right hand site of the home page, under Links click on Manage your AFM Profile. You and Your Money: What they don’t teach you in music school! If someone asked you: “What is your net worth?” Would you be able to answer? What would you say? This is another article designed to help fellow musicians manage their money. If you sold everything that you own, except for the clothes that you are currently wearing, and you took all the proceeds and paid off all your outstanding amounts owing then what you would have left over is your net worth. Net worth = your assets – your liabilities. To do this exercise you must be brutally honest with yourself. You have to use a considered and very reasonable assessment of what price your assets would command in today’s marketplace if you were actually able to find a buyer for them. Is that electric bass that you bought five years ago for say $2,000 actually saleable today for $2,000 or more? Probably not! Had you purchased a Stradivari violin at the same time that you purchased your electric bass then the Stradivari violin would probably command a selling price very much higher in today’s market than what you paid. And so the exercise goes for all of your assets. 1) Your net worth is positive: You have money left over. You are on the right track. The question then becomes a how good is that surplus to you for maintaining your lifestyle going forward. For those of you are at the point where you are the thinking about saving for retirement then ask yourself: “If you sold everything you own and added in your savings and any income from retirement plans how many years could you live on the proceeds?” This will be a wake-up call for many people. 2) Your net worth is negative: You still have money owing. You will have to come up with plans to turn that situation around the until your net worth then becomes positive. Of course, we all have this problem sometime in our lives particularly when we are starting out with our education and careers – paying off that student loan, that car loan, that mortgage, etc. There are very few people who go through life and do not have to struggle with this basic concept of personal finance. Look around you. All the regular ordinary people that you know who have been successful and have money to retire on have come to grips with this concept and have planned accordingly. This was conditional on their ability get work to acquire the funds in the first place. It takes money to raise children, to provide for a family, and to pay for a home and career planning to acquire the funds. This goes beyond saving money for a rainy day! Rainy day funds simply cover short term periods of job loss. Your net worth is your ability to provide for your activities and living expenses going forward into the future. This is your life. Only you can manage it! Matt Kennedy joined the Hamilton Musicians Guild in 1947 and was elected to the executive in 1951. A decades-long inside view of the music industry has given Kennedy a rare perspective. The 1980s was tough; the financial base of the local faced pressure. Gigs were drying up. “Miscellaneous” gigs (corporate Christmas parties, for example) were few and far between. Money was tight, but things held together largely due to the work and commitment of a few faithful, skilled executive members. President Emeritus Matt Kennedy was presented the Certificate of Life Time Achievement for his years of dedication and service to the members of the Hamilton Musicians’ Guild, Local 293, AFM/CFM at the Gala Dinner of the 2017 AFM Canadian Conference of Musicians.